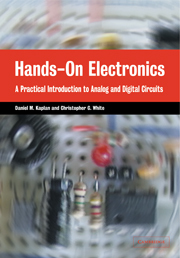 Packed full of real circuits to build and test, Hands-On Electronics is a unique introduction to analog and digital electronics theory and practice. Ideal both as a college textbook and for self-study, the friendly style, clear illustrations and construction details included in the book encourage rapid and effective learning of analog and digital circuit design theory. All the major topics for a typical one semester course are covered including RC circuits, diodes, transistors, op-amps, oscillators, TTL logic, counters, D/A converters and more. There are also chapters explaining how to use the equipment needed for the examples (oscilloscope, multimeter and breadboard) together with pin-out diagrams and manufacturers' specifications for all the key components referred to in the book.